James Jillson Selway is a graduate of The Juilliard School and The Catholic University of America. He is President of Harnes Selway Arts, Inc., Falls Church, Virginia. Mr. Selway maintains a Suzuki piano studio of 40 students and also directs operetta and music theater productions for the Harnes Selway Arts summer program, Singers Onstage.For over thirty years he has directed operetta for children and youth at festivals throughout the US, Canada, and Bermuda.. Mr. Selway is also Associate Director of the World Children’s Choir, founded and directed by his wife, soprano Sondra Harnes. Mr. Selway has performed as pianist and worked as choreographer with the World Children’s Choir at Carnegie Hall and at the Kennedy Center; at the White House, the National Archives, the National Building Museum and other Washington, D.C. venues for Presidents George H. W. Bush, Bill Clinton, George W. Bush, and for UN Secretary General Kofi Annan. Mr. Selway has also toured and led workshops with the World Children’s Choir in Canada, Ireland, Romania, and Scotland. Mr. Selway dances and performs with Dianne Braden in the song and dance duo Braden and Selway. 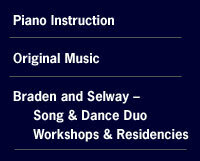 Braden and Selway perform for arts and community organizations, senior residences, and schools, and are associated with the BalletNova Center for Dancewhere they also perform and teach workshops for children and adults. Mr. Selway is also featured as Ambassador Drosselmeyer in the Center Dance Company’s production of The Nutcracker. At the invitation of recording and concert artist Susan Reed Mr. Selway appeared as artist-in-residence in February of 2004 and 2005 at Thacher Montessori School in Milton, Massachusetts. He has also done music theater workshops throughout the US, in Canada, and in Bermuda. Each summer he directs music theater classes and performances for children, teens, and adults at the Ogontz Suzuki Institute in Lisbon, New Hampshire, an assignment he has held since 1994.